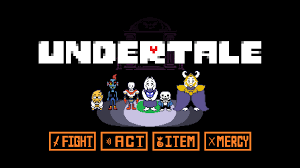 Undertale is a role-playing game made by Toby Fox and released September 15, 2015, for Microsoft Windows and OS X.Imagine, in the game, you are a small child that falls down a hole into the monster world, you must find your way through the Underground and make it to the barrier to break the spell and get home. Despite it’s seemingly normal facade, this game has a lot of depth and complexity. Nobody expected that this game, that isn’t even made by a big retailer, would blow up. Multiple YouTubers have played this wondrous game. From the pun-making skeleton to the stressed and depressed scientist, the characters have grabbed the hearts of many. So many can relate to all characters, whether a nobody wishing you were a superstar or a motherly figure who wants to help all, everyone can relate to at least one character. Undertale has a very pixelated art style, that of an old Nintendo game. It brings memories to 30-year-old men and women (give or take a few years) who would play games that looked like these. Undertale has gained an overwhelming 10 out of 10 stars on Steam. This game has shocked the internet with its beauty and life lessons. This makes me want to go to Stacey instead of Johnson..